In a 19th-century villa featuring a garden and swimming pool, Constantinopoli 104 has modern rooms. Just over a quarter mile from the Naples Cathedral, it also features a terrace and rooms with free Wi-Fi. A breakfast buffet is served daily. With stylish interiors, each room comes equipped with a TV with satellite channels, a minibar and some have views of the garden or surrounding areas. A breakfast with croissants, coffee and fruits can be enjoyed at the hotel’s lounge featuring an antique marble fireplace, or in the rooms. Naples National Archaeological Museum is a 5-minute walk from Hotel Constantinopoli. Napoli Central Station at Piazza Garibaldi is just 1 mile from the hotel. This hotel is in the center of the city, a 5-minute walk from Naples Cathedral. In an elegant building from the early 20th century it offers contemporary rooms with satellite TV. The spacious rooms come with parquet floors and air conditioning. Each includes a travertine marble bathroom complete with soft bathrobes, a hairdryer, and toiletries. Albergo Palazzo Decumani features a majestic marble staircase and crystal chandeliers. Free internet is provided throughout the hotel. Drinks can be enjoyed at the American bar and a free welcome drink is provided upon your arrival. The friendly staff can provide information on how to travel around Naples. 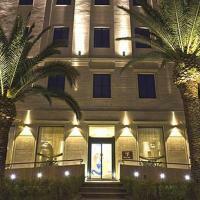 Albergo Decumani is 1 mile from Napoli Centrale Train Station and a 10-minute walk from the harbor. Located in the heart of Naples' historic centre, Decumani Hotel De Charme is set in a historic building. All rooms are air-conditioned and feature antique furniture, free Wi-Fi and flat-screen TVs with Sky channels. Guests can enjoy breakfast in the spacious and luxurious lounge, decorated with golden stuccoes and 18th-century mirrors. Reception is open 24 hours a day and staff can offer useful tourist information and arrange museum visits. Hotel De Charme Decumani offers elegant rooms with parquet floors, private balcony, and en suite bathroom complete with shower, hairdryer, and free toiletries. Some rooms feature a seating area, and a bathroom with spa bath. The hotel is 200 metres from the Church of Santa Chiara. Napoli Centrale Train Station, and the harbour for ferries to Sicily, Ischia and Capri, are both a 15-minute walk away. Admire the view of central Naples from the rooftop terrace at Hotel Mediterraneo, which also hot tub. This renovated, historic building features a fantastic location in the main shopping area and business district. Retreat from the bustle of Naples by relaxing in the hotel lobby, or in the comfort of the contemporary guest rooms. Every room has a private bathroom, air conditioning and a TV. You can choose from a selection of Mediterranean delicacies at the O’Break restaurant. The bar serves international cocktails. Renaissance Naples Hotel Mediterraneo features 11 conference rooms, a business center, and a well-equipped gym. H2C Hotel is just a 5-minute walk from Naples' port. This ultra-modern hotel features a top-floor gym with a relaxation area and sun terrace overlooking the Gulf of Naples. The 4-star hotel has elegant interiors in a building dating back to the 1930s. Throughout the hotel you can admire designer furniture and contemporary works of art. Decorated in neutral colors, all rooms are air conditioned. They also feature a minibar, tea and coffee-making facilities and a flat-screen TV with CD player. H2C Hotel Napoli serves a varied buffet breakfast each morning. Bambù restaurant serves Neapolitan and Italian cuisine including a selection of organic ingredients, local desserts and fine wines. The hotel has good services around Naples by bus and private parking is available in a secure garage nearby. The historic center of the city is a 5-minute walk away. With a fantastic location between the port and the station, Alloggio Del Conte is ideal for your stay in Naples. You'll love the free bottle of local wine on arrival. This cozy hotel gives you affordable accommodations and modern comforts, including free Wi-Fi access. You are just a few steps away from the main street of Corso Umberto I and have an excellent choice of traditional restaurants where you can enjoy a Neapolitan pizza. The friendly team of staff are always on hand to give you tourist information and tips. Don't forget your free city map from reception. Start your day at Hotel Alloggio Del Conte with a typical Italian breakfast in the comfortable lounge. Would you like to go on an interesting day trip? You can take the Circumvesuviana train from Central Station to Pompeii and Sorrento or catch a boat to the islands of Ischia and Capri. Villa Margherita is a renovated 19th-century villa located on Via del Parco Margherita, one of the most fashionable and exclusive areas of Naples. Guests can admire the hotel’s breathtaking views of Capri from their newly refurbished rooms or from the hotel’s panoramic roof garden. Some rooms also come with their own balcony. 101 Sensitive Restaurant serves Italian cuisine and dishes from the Campania region Surrounded by elegant old buildings and conveniently situated close to bus stops, the underground metro and the cable car, this hotel is also close to the city’s Vomero shopping district. Grand Hotel Parker's offers extremely luxurious accommodations in the residential Corso Vittorio Emanuele. Guests enjoy amazing views of the Gulf of Naples, and good access to public transportation. The Parker's matches the elegance of its fashionable district. Rooms are spacious and air-conditioned. Each has a balcony, some offer sea views. The hotel has a bar and cigar room. The George Restaurant, on the top floor, serves the finest Mediterranean cuisine. The B&B Dei Decumani is located in the heart of the historic center. It is next to Naples’ Cathedral, the Duomo di San Gennaro. This modern bed and breakfast is set in an 18th-century building. It is tastefully decorated in a contemporary, Avant-garde style. The B&B Dei Decumani is small and intimate, with just a few guest accommodations. The friendly team of staff guarantee a warm welcome and a personalized service. Start your day with breakfast in your room and then explore Naples, with all the main attractions just a short stroll away. Residenza Echia offers spacious self-catering rooms. It is located 650 ft from Naples' Castel dell'Ovo, in the lovely, seaside neighborhood between Santa Lucia and Riviera di Chiaia. The Echia's rooms come with free wired internet, fully equipped kitchenette, and a flat-screen TV. Le Stanze del Vicere is a beautifully restored 16th-century residence just 280 yards from the National Archaeological Museum and a 10 minute walk from Naples' central train station. In this historic part of Naples you will be close to important museums and churches as well as exclusive shopping streets, meaning that you can explore most of the city by foot. Metro and bus routes run from close by the hotel, making Le Stanze del Vicere a great base for day trips as well. Inside family-run Stanze del Vicere you will discover elegant 16th-century style furnishings and frescoes combined with modern services such as free WiFi. Outside you can enjoy the hotel’s pretty little garden, where you can sit and enjoy the peace and quiet after exploring Naples. Attico Partenopeo is a fashionable B&B in Naples, just behind the Umberto I Gallery. It features a panoramic rooftop terrace, and a mix of contemporary works of art and traditional architecture. Wi-Fi is free. Each guest room of the Attico features an LCD TV, air conditioning, deluxe mattresses, and extra-large shower cubicles. Some rooms have a private terrace. The buffet breakfast includes every morning a wide selection of sweet and savoury items, such as organic jams and honey, traditional pastries, cheese, cold cuts and more. Friendly staff can provide expert advice and recommendations, plus tickets to the latest cultural events. Free photocopying and fax services are available. In a 16th-century building, Hotel Piazza Bellini is in Naples’ historic center, 330 yards from Museo Metro Station. The uniquely decorated rooms combine modern design and artistic elements. Rooms feature original paintings by local artist Alessandro Cocchia. They come equipped with air conditioning, flat-screen TV and hardwood floors. Some also have a balcony. The hotel includes a charming courtyard, decorated with statues and stone floors. It is furnished with sofas and armchairs. The property also features a colorful breakfast room. Piazza Bellini Hotel is a 5 minute walk from the Spaccanapoli shopping area. Naples Cathedral is less than half a mile away, while the harbor is one mile from the hotel. Hotel Paradiso features an unforgettable view of the Bay of Naples and Mount Vesuvius from its location on Posillipo Hill. The terrace is a great place to enjoy the panorama. Best Western Hotel Paradiso has comfortable guest rooms with free Wi-Fi access. Most rooms feature a balcony. The restaurant on the terrace serves typical, Mediterranean dishes and is a great choice for a romantic meal with a view. The hotel is well connected to central Naples by public transportation, and is close to the Mergelina Marina where you can depart from for the islands of Ischia and Capri. Discounted rates are available at a partner parking area nearby. Hotel Prati is 500 metres from Naples Central Railway Station and Metro in Piazza Garibaldi. It offers air-conditioned rooms with satellite TV and views across Naples centre. Breakfast is served on the roof garden, with great views of Mount Vesuvius and Castel Sant'Elmo. The restaurant offers classic Italian cuisine and regional dishes. The Prati Hotel is located in Naples' museum and art gallery district, close to the National Archeological Museum and a 10-minute walk from Naples Cathedral. Pompeii and Sorrento are a 45-minute train ride from Piazza Garibaldi Station. A tram takes to Beverello Port in 10 minutes, with connections to stunning islands such as Capri, Ischia and Procida. Hotel Cavour is set in Piazza Garibaldi, a few steps from Central Train Station and the Circumvesuviana train stop. 220 yards away you will find the historic center of town. Set in a historic, 19th-century property, the Cavour Hotel features modern conference rooms and an information desk where you can arrange all types of cultural tours. Each guest room comes with air conditioning and Wi-Fi access. Some of the suites feature a panoramic terrace. The restaurant offers Mediterranean cuisine with a choice between a fixed price set meals or dishes from the menu. Hotel Miramare is set between Piazza del Plebiscito and Castel dell'Ovo. 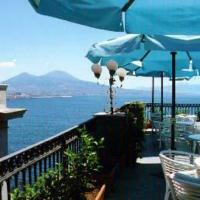 The terrace offers great views of the Bay of Naples, and during summer breakfast is served here. The rooms include a balcony and free Wi-Fi. The hotel is on the seaside promenade, with great public transportation, including the harbor and buses for Napoli Centrale Train Station. A pick-up service from the airport is available. The Miramare is in a Liberty villa of the early 20th century. You can also find this period style in the restaurant, serving classic Italian cuisine and local specialties. Breakfast is continental style. Each room comes equipped with air conditioning, a satellite TV with DVD player, and a tea/coffee maker. Some rooms offer views of the sea. 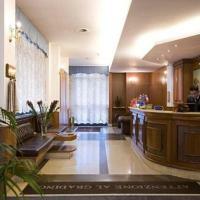 The warm atmosphere at Hotel Miramare is complemented by a friendly and professional staff. Europa Grand Hotel is in a 19th-century building right next to Napoli Piazza Garibaldi Train Station. 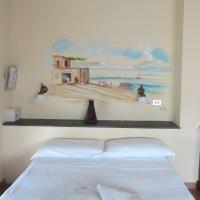 All rooms are air-conditioned, and the restaurant serves traditional Neapolitan cuisine. Rooms at Europa Grand Hotel & Restaurant feature different frescoes, and come equipped with satellite TV, and have a private bathroom with bathtub or shower, and Wi-Fi access. Some suites feature original walls in tufa stone, or a spa tub. The restaurant La Falena, specializes in local dishes and is open for breakfast, lunch and dinner. An hour of free Wi-Fi is included. The Europa's staff can provide tourist and travel info and is available 24 hours. The hotel is near the Circumvesuviana Train to Pompeii and Sorrento. Start your day with breakfast up on the roof garden at the Executive Hotel, set in a safe and central neighbourhood in Naples. Each guest room is soundproofed and comes with air conditioning and satellite TV. Breakfast is included and can be enjoyed in your room, in the breakfast hall or, in warmer weather, on the roof garden. At Hotel Executive you will be taken care of by their excellent team of friendly and helpful staff. The hotel includes a sun terrace and a cosy lounge. Set in an early-20th-century Art Nouveau building, Villa Medici offers free Wi-Fi, spacious rooms and an outdoor pool in a quiet, residential area of Naples. Rooms and suites at Villa Medici feature air conditioning, satellite TV, minibar, and a safe. Some rooms have a panoramic balcony overlooking the private garden. The historic center of Naples is a 15-minute Metro ride away. Agnano and Bagnoli Metro Stations are both within 10 minutes' walk. Arenile di Bagnoli beach is only less than half a mile away and features a lively nightlife. In the surroundings there are also a science park (Nisida), a zoo, horse racing tracks, museums, a stadium and the large exhibition complex of Mostra D'Oltremare. The staff at the Medici can suggest the best sightseeing itineraries and assist you in your travel or business needs. Parking at the hotel is free. The Europeo Hotel is in the historic center of Naples, a UNESCO World Heritage Site, next to Federico II University. It features colorful rooms with free Wi-Fi, and is a 10-minute walk from Dante Metro. Air-conditioned rooms at the Europeo include free satellite TV. The private bathroom has a hairdryer and free toiletries. The hotel is a 10-minute bus ride from Naples Central Station, taking bus R2 in the direction of Piazza Municipio. The staff can assist with tourist information. Set in Naples' most historic district, Hotel Il Convento is housed in an ancient building, dating back to the 17th century. Experience a quieter side of Naples in this neighborhood. This hotel is full of character and old-world charm. It is right next to the Convent of Santa Maria Francesca. Just a few steps away you will find the pedestrian shopping area of Via Toledo. The port is also just a short walk away with departures for Capri, Ischia, and Sicily. Each room comes with air conditioning and satellite TV, plus a private balcony. The junior suite features a floral roof garden where you can relax in peace. You will find a free internet point and lots of tourist information at reception. Getting around Naples is easy when staying at Il Convento. Catch a local bus from the stop 55 yards away or the metro from the nearest station, 550 yards away. However, you will find lots of interesting monuments and churches in the area, and of course typical restaurants and pizzerias. Hotel des Artistes is located in a quiet courtyard in the center of Naples, 5 minutes from a Metro stop and close to the train station and Naples Cathedral. From this great, central location, Naples is nearby and its many great shopping streets are just around the corner. In a safe and tranquil area of the city, due to its great public transportation this hotel is also an ideal base for day trips in the surrounding area. Buses take you straight from the hotel to the port, from where you can visit the islands, and from the train station nearby you can arrive at Pompei, Sorrento and Positano in just a short time. Hotel des Artistes is in an elegant restored building and is well-maintained and comfortable, offering modern amenities and friendly service. Just 220 yards from Central Station, Best Western Hotel Plaza features a number of modern amenities and free Wi-Fi throughout. Enjoy a generous breakfast buffet on the rooftop terrace. This stylish hotel is housed in a 19th-century building, which has been completely restructured. The guest rooms come with air conditioning and satellite TV. A hot and cold buffet breakfast is included in the room price, and is served on the terrace. From here, admire a beautiful view of Castel Sant' Elmo and Certosa San Martino. The cafe provides simple Neapolitan dishes, brunches, and business meals. At the Hotel Plaza you are close to the Metro and Circumvesuviana trains. It offers shuttle buses to the port of Naples and Capodichino Airport for an extra fee. There is a great team of multilingual staff available 24 hours a day to make sure your stay goes smoothly. Personal computers are available for rent free of charge. In central Naples, the Ideal is right across from Piazza Garibaldi Train Station. This family-run hotel features an outdoor terrace, and rooms with private bathrooms with balcony. Hotel Ideal occupies 2 floors of a renovated 20th-century building with no elevator. The property provides a free welcome drink to all its guests. All air-conditioned rooms are decorated in warm colors with soft lighting, and each provides a satellite TV. A continental breakfast is served daily, and includes freshly baked pastries and cappuccino coffee. The restaurant serves traditional dishes from Naples. The bar on the first floor is open between 7:30 pm and 1 am. The hotel is just over 1 mile from the port, where ferries leave for Sicily and the Aeolian Islands. Capodichino Airport is a 20-minute drive away, and staff can arrange transportation upon request. The Hotel Duomo is a friendly family-run hotel set in the heart of the historic center of Naples. It offers clean, no-frills, affordable accommodations. Just 55 yards from the Duomo, the hotel is located on the first floor of an 18th-century building without an elevator. Many of the city's monuments are within walking distance of Hotel Duomo. Hotel staff speak fluent English and can offer advice on sightseeing, tours and nearby restaurants and pizzerias. All rooms at the Hotel Duomo are spacious and face quiet secondary streets or the building's courtyard. In-room amenities include a telephone, a safe, heating, a fan and a hairdryer. Chiaja Hotel is on the first floor of a former noble residence, on one of Naples' most elegant shopping streets, 22 yards from Piazza del Plebiscito. Internet is free. Chiaja Hotel de Charme is just a 5-minute walk from the seafront and the port, with ferries and hydrofoils for Capri and Ischia islands. All rooms at Hotel Chiaja are air-conditioned and offer a satellite TV and a private bathroom with hairdryer. Some rooms overlook Via Chiaia and come with a jacuzzi tub. Breakfast includes fresh fruit and croissants and pastries straight from the oven. A sweet and savory buffet is served in the afternoon. Located in one of the most historically important streets in Naples, the hotel is set in the ancient center of the city, surrounded by the most beautiful open archeological finds in the city. Opened during the 1960’s, and restored several times to offer the most modern comforts, the Hotel Nettuno owes its name to the very famous statue of Neptune’s God, created by Michelangelo Naccherino in 1599. After a long day you can relax on the hotel’s roof-garden, where it is possible to admire the most beautiful Sacred Domes in the city, such as Santa Maria La Nova or the Monastery of Santa Chiara, as well as a partial panorama of Vesuvio’s peak and the nearby Mountain Somma. Located a 10-minute walk from Bagnoli Metro Station, Best Western Hotel San Germano is a 10-minute metro ride from central Naples. It offers an outdoor pool and free Wi-Fi. Rooms at San Germano Hotel are all air conditioned and come with satellite TV and a minibar. Their private bathrooms have a hairdryer and toiletries. Restaurant Le Acacie serves Italian cuisine and Neapolitan specialties prepared with fresh local products. The breakfast buffet includes savory and sweet food. The outdoor pool with snack bar overlooks the surrounding countryside and features lounge chairs and sun umbrellas. It hosts cocktail parties and musical events. Best Western San Germano is around a 5-minute drive from highway A56 and Pozzuoli, where ferries leave for the island of Ischia. In a 19th-century building in central Naples, Bed & Breakfast Napoli Centrale Hotel is a 2 minute walk from the bus terminus and Napoli Centrale Train Station. Wi-Fi is free. Rooms have air conditioning and satellite TV. At the front desk you can rent laptops for free. Hotel Zara Napoli is situated only 220 yards from the stores of Corso Umberto, a 5-minute walk from Naples Central Train Station. There is a 24-hour front desk and free Wi-Fi. Rooms at the Zara are air conditioned and equipped with a flat-screen TV. Most have a private bathroom, while some have shared facilities. The staff can suggest the best places to enjoy original Neapolitan pizza, and give recommendations for your stay in Naples. The Hotel Ginevra is an intimate, family-run hotel close to Central Train Station and the port of Naples. Refurbished in January 2009, it offers clean and comfortable guest accommodations. Each room at the Ginevra Hotel has a unique, ethnic design. The popular shopping street Corso Umberto is just 220 mile away and the hotel is surrounded by great restaurants, cafes and of course, pizzerias. There is a traditional market just a few steps away where you can find lots of typical Neapolitan produce. The friendly staff are always available to help you plan your stay in Naples and beyond. For those of you who are traveling to the islands of Capri, Ischia, Procida or Sicily, Hotel Ginevra is located close to the main port and ferry terminal. Hotel San Paolo offers free Wi-Fi access in common areas and a free parking lot. It is close to the PalaEldo Arena and the San Paolo soccer stadium. The San Paolo's roof garden features views over Bagnoli Bay and Capo Posillipo. Choosing the San Paolo Hotel means you are out of the chaotic inner city but well connected to it by metro. In the surrounding area you can find lots of sports and recreational facilities, plus the Mostra d'Oltremare convention center. As a guest at Hotel San Paolo you can benefit from special rates at a swimming pool just 110 yards away. Hotel del Real Orto Botanico is set in a wonderful building, located in front of the beautiful Botanical Gardens in the the center of Naples. Within a half-mile radius you can visit the National Archaeological Museum, Piazza Cavour, Capodimonte Observatory and the Duomo. You can find typical restaurants and pizzerias nearby. 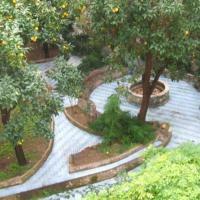 Hotel del Real Orto Botanico is within easy reach of Naples transport system. The hotel is 660 yards from the nearest metro station. Relax in the reading room with piano, in the garden, or on the outdoor terrace with a fantastic view of the town. All the spacious rooms are elegantly furnished and equipped with modern comforts including satellite TV, Wi-Fi connection, and air-conditioning. Offering 360° views out over the Gulf of Naples, San Francesco al Monte is a restored 16th-century monastery. It is a 2 minute walk from the Corso Vittorio Emanuele funicular stop. Featuring 2 rooftop pools and a rooftop restaurant, this 4-star hotel is a luxurious setting for a stay in Naples. It is at the foot of the Sant'Elmo Fortress and the Certosa di San Martino Museum. Guests can admire the original frescoes and medieval décor throughout San Francesco al Monte. Once the monks' chambers, rooms here have beautiful views of the bay. They are all air conditioned and come equipped with satellite TV, a minibar and a private bathroom with hydro-massage shower or bath. Breakfast is buffet style and is served in La Terrazza dei Barbanti restaurant terrace on the 4th floor. Here guests can enjoy Mediterranean cuisine and fine wines for lunch and dinner. Albergo del Golfo is in the heart of Naples close to the port and the shopping area around Via Roma. The rooms have TV and air conditioning. Albergo del Golfo features free Wi-Fi throughout the property. A typical Italian breakfast is available between 7:30 am and 10 am. Special rates are available at a secure garage just 320 yards from the property. Hotel De La Ville offers affordable accommodations in the heart of Naples, less than 550 yards from Central Train Station and close to the business district. The helpful team of staff are always on hand and are committed to providing excellent service. They can provide you with tourist information and lots of local knowledge about Naples and the surrounding area. Hotel De La Ville has excellent public transportation connections and is close to the bus station and metro stop. From Central Train Station you can catch the Circumvesuviana train along the Amalfi Coast to Pompeii and Sorrento. The San Marco Hotel is ideally located in a pleasant neighborhood in Naples close to both the port and the historic center. This recently renovated hotel offers comfortable guest rooms in an excellent location set in the city’s main square, Piazza Municipio. The Hotel San Marco is a great choice if you wish to visit the nearby islands in the Gulf of Naples, including Ischia and Capri. It is extremely close to the main port and the ferry terminal of Stazione Marittima. The city’s historic center is also nearby and many famous monuments, churches and museums are within walking distance. Located conveniently close to Naples Centrale Train Station, Hotel Nuovo Rebecchino has been offering comfortable accommodations since 1890. Make the most of free Wi-Fi internet access here. The Nuovo Rebecchino is just across the square from a Metro station, bus stops, and the Circumvesuviana train line which will take you down the coast and to Pompeii. The airport bus also stops nearby. The staff at the Nuovo Rebecchino are friendly, professional and available 24 hours a day. There is a bar on site, as well as meeting rooms and a billiards room. Use the free internet point available or connect to the Wi-Fi on your own laptop, in rooms or the lounge. Hotel Nuovo Rebecchino's rooms come with satellite TV, air conditioning and minibars. The Clarean, enjoying an extremely central position by Piazza Garibaldi, is a recently opened, modern and trendy hotel, respecting the environment and offering every comfort for a delightful Neapolitan experience. The building was created by the Italian contemporary architect Cino Zucchi, who used natural materials, vaulting stone arches, wooden attics and parquet floors. The careful design and final decorative touches provide a modern, refined atmosphere, ideal for a relaxing stay after pleasant days in the hustle and bustle of Naples’ streets. Let the friendly and caring staff suggest you the best itineraries and venues in town and around the area, take advantage of the Clarean’s proximity to all main means of public transportation and you are sure to enjoy a pleasant stay. Hotel Garden Napoli is set in central Piazza Garibaldi. The breakfast room offers a beautiful city view. There is free internet at the lobby with 24-hour reception. Hotel Garden Napoli offers quick access to the city transport system and is a 2 minute walk from Napoli Centrale Train Station. All rooms at Hotel Garden are air-conditioned. Several also offer a charming terrace with a beautiful view of Naples. Hotel Toledo is a welcoming hotel set just a 10 minute walk from Piazza del Plebiscito and the harbor. Relax on the rooftop terrace and enjoy views of Sant’Elmo Fortress. Set on the outskirts of the Spanish Quarter, Hotel Toledo allows you to stay right in the heart of historic, picturesque Naples. Via Toledo, one of Naples’ main shopping areas, is just a few steps away. Although Hotel Toledo’s building dates back to the 18th century, inside you can enjoy modern amenities. A free internet point is available at reception and comfortable rooms come with Wi-Fi access and satellite TV. Enjoy an Italian breakfast in the breakfast room or on the rooftop terrace. Hotel Toledo’s rooftop is full of plants and flowers and has plenty of space for you to sit and enjoy the sun. You can also play ping-pong, or work out on the exercise bike provided. 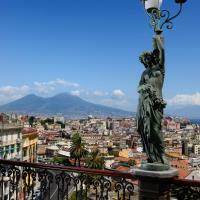 Cesare Augusto is a 5 minute walk from Lala Metro Station with the historic center of Naples just 2 metro stops away. It has a free parking lot and internet point. The accommodations are clean and comfortable with air conditioning. A buffet breakfast is included. The hotel features a restaurant and a terrace where you can eat and sunbathe. Staying at Cesare Augusto means that you are close to San Paolo Stadium and Mostra d'Oltremare Convention Centre. There is excellent bus and metro service around Naples. Hotel San Giorgio is a completely renovated 3-star superior hotel, located near Napoli Centrale and Piazza Garibaldi Train Stations, the main hub of national and local transport in Naples. Rooms are air conditioned and feature a flat-screen TV with pay-per-view channels, and there are free internet terminals at reception. 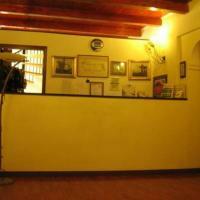 The San Giorgio Hotel is ideal for visiting main tourist destinations of the city and the entire coastline. The nearby Circumvesuviana Line takes you to the archaeological ruins of Pompeii or the pretty town of Sorrento. All rooms are en suite and feature wardrobe and a safe. You will also find a small fridge and free tea and coffee. A varied buffet breakfast is served each morning. The staff has been rewarded for its quality, and modern conference facilities are available. You can check-out at 13:00 if you show your booking confirmation upon arrival. Magri’s Hotel will be your guide to Naples and the beauty of its surroundings. Located by the train station, it offers excellent access to the city and regional public transportation systems. Staying at the Magri’s, you can easily enjoy the lively historic center of town, or conveniently do business in the nearby Centro Direzionale, the business and commercial hub of the city. You can also easily visit the pleasant nearby towns, which are served by the Circumvesuviana train network. Relaxation and comfort are guaranteed at the Magri’s, where you can rest in the well-equipped, spacious rooms and have delicious drinks in the elegant restaurant. You can also enjoy a drink from the bar on the sun terrace, or work out in a modern gym. Located just a 5 minute walk from the harbor, Bovio Suite is set on the 4th floor of an early 20th-century building. Accommodations here are convenient, friendly and well-maintained. Enjoy a pleasant stroll around Naples's historic center from Bovio Suite, or book one of the many trips and tours available at reception. Bovio's Suites are spacious and bright and you will enjoy splendid views of the square from their balconies. Interiors feature period furniture and antiques and rooms all come with free Wi-Fi internet access. Enjoying a great location just off the waterfront, near Naples’ port, affordable Hotel Bella Capri is ideal for exploring the city and day trips in the surrounding area. Right in front of the port, you can be boarding a ferry for Capri or Ischia just minutes after leaving your room. Buses traveling to Pompei, Sorrento and Amalfi stop just 5 minutes away from the hotel and in the surrounding area you will find a host of restaurants and cafes, where you can enjoy delicious Neopolitan specialties. This friendly and well-maintained hotel is also just walking distance from some of Naples’ best sights including Castel Nuovo and the Galleria Umberto I. Some rooms have balconies with charming views of the port area and the hotel enjoys a large terrace overlooking the bay of Naples, with Vesuvius, Sorrento and Capri all in the background. The hotel also provides free internet access, use of the kitchen and a lounge with wide-screen TV and DVDs. Enjoy the Neapolitan sun on the pleasant roof garden of the stylish Hotel Leopardi, completely renovated and strategically located in the Fuorigrotta neighborhood, close to Mergellina and its seaside promenade. All the rooms are functional, comfortable and fully furnished. The friendly, welcoming staff provides high quality service and is available to help you arrange special trips around the city. In summer, the roof garden becomes the enchanted setting to enjoy breakfast or to relax at night, sipping an aperitif. Are you looking for central accommodations in Naples? The unbeatable location of Hotel Potenza makes it the perfect choice; right across from the Central Station. In Piazza Garibaldi, the Potenza Hotel provides easy access to public transportation including train, metro and bus. It is also great for anyone wishing to travel to the nearby islands of Ischia or Capri, as it is close to the port. This recently refurbished hotel features comfortable guest rooms equipped with air conditioning and wired internet access. The friendly staff is on hand to help make your stay here a pleasant one, plus they speak English. As a guest at Hotel Potenza you can enjoy discounted rates at a nearby restaurant and pizzeria.